February 3 – Come and hear about our new altar commission, which is part of our 150th anniversary celebration! Sam Bardwell will lead a conversation about the wood, artistry, and theology of the new altar. 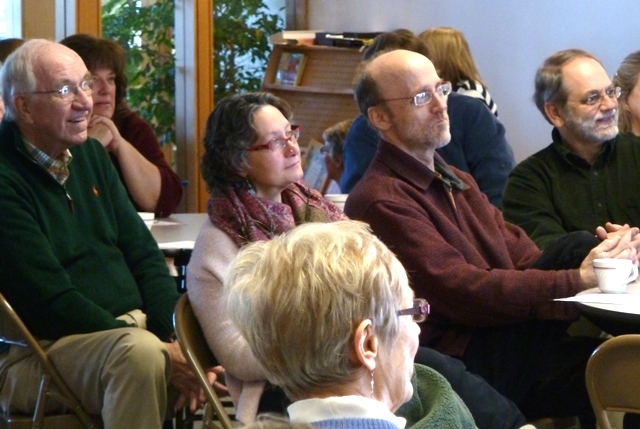 February 10 – Racism and homelessness, session 2: Following up on our conversation with Sandy Aslaksen on January 27, we will continue to dig into this topic as a congregation. February 24 – Sharing our Spiritual Journeys – As we gear up for another round of Living Questions, our ministry of welcome for newcomers, we will wonder with each other about the questions and experiences that have guided or undergirded our spiritual lives up to this point. We will share stories about our spiritual journeys around tables. Question prompts will be provided. March 3 – Strategic Planning – Save the date for an important strategic planning forum! The strategic planning team will share back what we heard from the stories we collected over January and February, and we will engage in creative work together as we explore the identity and future of OSLC. Over the season of Lent, we will be making use of Signs of Belonging: Luther’s Marks of the Church and the Christian Life by Mary Hinkle Shore. We will use the book in adult faith formation on Sunday mornings and in Living Questions. If you would like a copy, please sign up on the clipboard in the narthex by February 27. Books are $12. Please make a check out to Our Saviour’s with “Signs of Belonging” in the memo line, and place it in the offering plate on Sunday or in Pastor Martha’s mailbox in the office. If you cannot afford it but would still like a copy, please let Pastor Martha know.